I remember when I graduated from college 4.5 years ago. I had just enough money saved up to move from Montana to the Pacific Northwest and rent a house close to my work. After the first and last month's payments and security deposit I looked at my bank account and realized I had absolutely nothing left. At the time I was worth about -$13,000 dollars. I distinctly remember sitting on the floor of the living room of my completely empty house with my laptop, streaming movies on my neighbor's wifi which they had thankfully failed to encrypt. I had a blow up camping air mattress and a suitcase full of clothing and personal hygiene products. My kitchen was empty except for one fork, one spoon, a water bottle and a bowl. My pantry consisted of oatmeal, and ramen noodles -leftovers from my college stash. I walked to work as I did not have enough money to put gas in my car. After two weeks of work I received my first paycheck and it was time to start tackling debt and building my empire. I look back upon this time, and the previous four years in college, fondly. While it was difficult and I had to sacrifice all luxury, it taught me that I could survive and thrive on very little. It also taught me that if I wanted more, I would have to work hard and sacrifice for it. The best time to start saving money and tackling debts is TODAY. Feeling sorry for yourself or your situation will do nothing to improve it. The only thing that will improve your situation is being honest with yourself and finding the resolve to make change. You have to make the decision that at this very moment you are done with debt and ready to start saving money. Life with debt is tough. Paying off debts, $1,000, $10,000, even $100,000 + while providing a quality for yourself and family is not easy, but it is achievable. The first step to solving your problem is to sit down and figure out the underlying issue. To do this you need to know EXACTLY what you are spending money on. I personally use Mint to track my expenses, but the program or method really doesn't matter in the end. 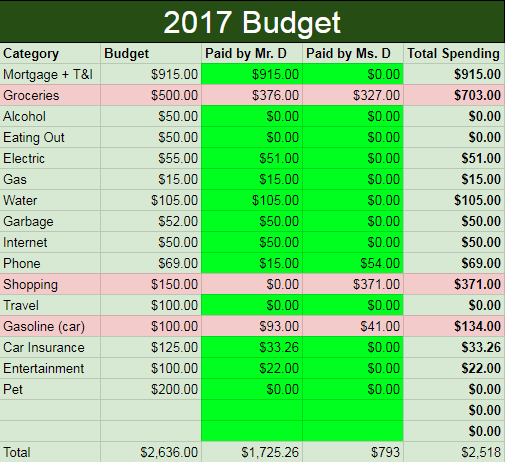 What matters is that you CONSISTENTLY track what you are spending and categorize it into a budget. How do I save money and pay off my debt? Step 1: Write down everything you spent money on and categorize it. 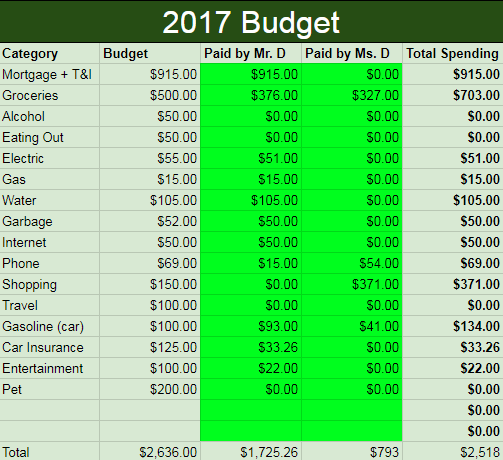 I will use the budget from our DebtFreeDuo spreadsheet as an example. Your budget can look any way you want it to. You may have totally different categories than I do and that is OK. Step 2: Analyze where you are missing the mark. 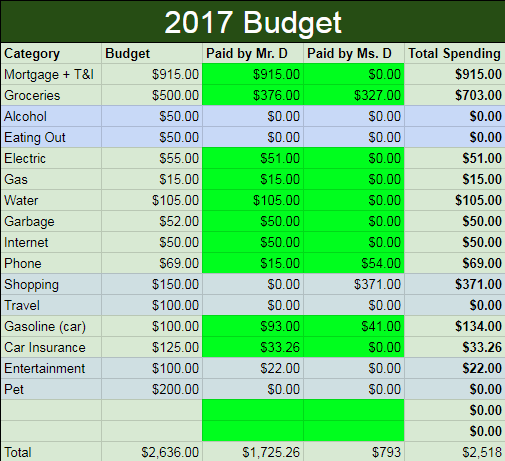 We can quickly see that we went over budget in shopping, gasoline and groceries -and the month isn't even over! I would never know these were our problem areas if I wasn't keeping track of this information. We see that we could save $458+ right here by bringing these numbers in line with our budget. Step 3: Look for categories that are not required and remove them. These are things you do not need to survive. The extras that need to be eliminated if you are in a debt emergency. Right away I see we could save $650 per month by eliminating these non-necessary items. You can bet that when I was eating ramen noodles on my empty living room floor I did not have any of these expenses. Now that we have well paying jobs and are aggressively paying down debt, we allow ourselves to indulge on some of these extras. If you are unable to make your minimum monthly debt payments these items need to go NOW. If you are able to make your minimum monthly payments then it is ok to budget these back into your life. Self care is extremely important and you must strike a balance to avoid burnout. Just be honest with how much you need. Remember: spending money does NOT equal happiness. Your situation is unique to you and your family. What other people do with their money MUST have no effect on you. 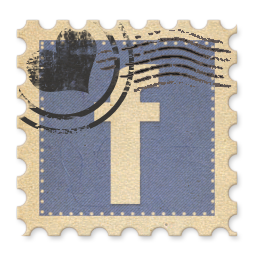 I don't care if your co-worker just bought a new car or your Facebook friend took a fancy vacation to a beautiful tropical destination. 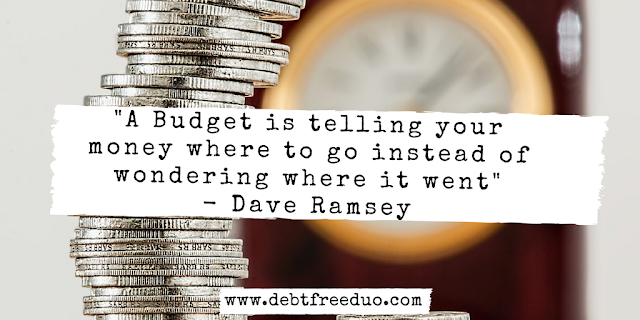 Look at your budget and be honest with yourself. Your money has only two purposes right now. Paying your necessary bills, and destroying debt. Once that debt is gone, continue with the honesty and start putting your money to work for yourself by investing. I can almost guarantee that your Facebook friend constantly posting pictures of their new toys and adventures is not in a healthy financial situation. People tend to use money to buy things that cause a temporary happiness or high. This is a dangerous cycle because when that high wears off they need to move on to the next high. Facing financial reality is HARD BUT NECESSARY. Out of control spending is not a sustainable life situation and will almost certainly end in financial failure and bankruptcy. I have a friend who is constantly complaining about money. When you are near him you can see the stress and hardship his financial situation is causing him. Almost every conversation he engages in includes him worrying and complaining about not having enough money to live a good life. Because I love helping people with their finances we sat down and went over his spending (Step 1). His situation was indeed difficult and painful. Alimony, medical bills, massive student debt. He was deep in a hole and needed to start digging immediately. It was also very easy to see areas which could be improved. Almost all meals were eaten out at restaurants/fast food. His alcohol and entertainment budgets were both in the three-figure range, yet another stress coping mechanism. Cable TV? Cut it immediately. By redirecting these additional expenses he could have easily diverted hundreds of dollars a month to paying off the debt that was crushing him. Not to mention the health benefits of cutting back on alcohol and eating out. On top of this, he was offered additional shifts at work and promptly refused all overtime opportunities. I wanted to (and still want to) help him so badly. But, after he refused to make any life changes I learned an important lesson. Nobody can do this for you. You have to make the decision to change for yourself and stick with it. When you do make that decision we will be here to support you. 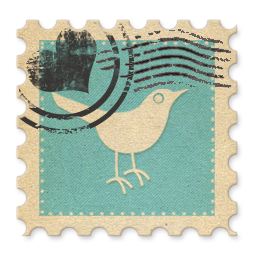 The personal finance blogging community is full of some of the friendliest, most accepting people I have ever met. In addition to this, Instagram has a very healthy #debtfreecommunity who are more than happy to support you in your journey. Good luck to you and I wish you the very best. Thank you for reading!